Some updates from Daniel's Google+ page. The first one is the link to the exclusive clip from Kill Your Darlings which did premiere on Live with Kelly and Michael on Monday. The clip can be viewed via ew.com or below. 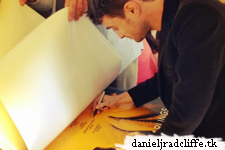 Then there is Dan visiting MTV monday 30th September (see also our Facebook page for another photo). Hopefully the interview will be online soon.